We have all experienced the frustration of having fabric dye transfer in the wash to other laundry items. Removing the offending dye can be difficult. This page offers some solutions for removing dye transfer from towels. I read about using boiling water and bleach for taking out color bleeding. It appears that these were white clothes. What about green towels that had a red towel thrown in? They are now an awful brown color. Will the boiling water and bleach work on colored items? Bleach on your green/brown towel will take out the green as well as the red. It may not put spots on the towel, if you have dissolved the bleach in the water thoroughly, but it will fade out the green and the red both. You will just end up with faded brown towels. You could try just using a hot wash with lots of detergent. I don't think that would hurt the towels in any way. I would be wary of any color remover, as I think it would remove the original green as well as the new red. Try "Dye Grabber". It worked great for me with some similarly stained clothing. I washed a nice cream color towel with different colored towels, and the red bled onto the cream towels. Can I use bleach on the cream color towel to get the color bleed out? Try soaking in color-safe bleach. If you frequently have to do mixed- color loads, invest in Shout! Color Catcher sheets to "catch" the dye. Better than ruining towels or clothes. 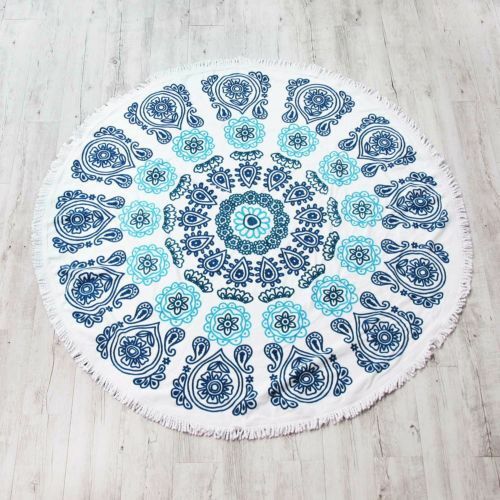 I have this white cotton beach towel with a blue print on it. I accidentally washed my son's red shirt with it and now the white has turned pink. I have tried soaking it in soaker and then washing it and hanging it in the sun, but it's only faded the colour a little. Can you suggest anything else I can do to remove the colour with out ruining the blue print on it, so I don't have to buy a new one to replace it? 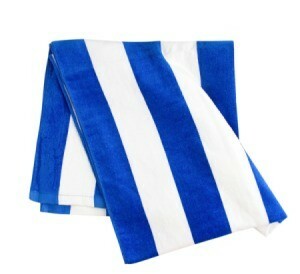 I've attached an image of the towel that I brought. Soak overnight in a 5-gallon bucket of hot water with a couple of tablespoons each of hydrogen peroxide and powdered dishwasher detergent. I washed a white towel with a green one in hot water. The greed dye has run. I have kept the old white towel (now light green) wet. What is the best solution to get it back to white?